My Vinitaly over the last four years has always started in the same way, with Susanna Crociani, my dear friend and producer of Vino Nobile di Montepulciano. I have written about her wines numerous times so today, all I will say is if you are at Vinitaly, go to pavilion 8, stand B14 and try them for yourself. Susanna, journalist friends and I have shared an apartment for most of the last four years at Vinitaly. It’s great and very homey. Last year I worked for Vinitaly during the fair so I stayed in a hotel but this year, I’m back in the family fold, discussing wines over the dinner table at our house instead of out on the town. I wouldn’t say that we are slouching though. Yesterday we shared a pretty amazing bottle over dinner and they always introduce me to some new, exceptional Italian food product. This year we had a cheese feast which I will likely digest by next week 🙂 but wow did I enjoy that. I tried an Italian cheese I had never heard of Monte Veronese stagionato (aged) for example. Mostly, I learn from them,Giampaolo Giacomelli and his wife Bruna, owners of an enoteca near Sarzana in Liguria, Il Mulino del Cibus, about their winemaker friends and products that they have tried. It is a real education for me besides being very funny. The first day I always spend in Tuscany, saying hello to old friends and trying their new wines. When I emerge from Tuscany, I try to visit a few regions every day. Yesterday I made it to Vigne Vignaioli Terroir Vinitaly, a new area within Vinitaly that focuses on organic, sustainable and biodynamic wines. There have always been producers who follow the various criteria that are required for each of these “designations” within the fair but there has never been the focus that has come into play this year. This group of 127 producers showcases a mixture of different regions and with a variety of reasons for using natural winemaking methods. 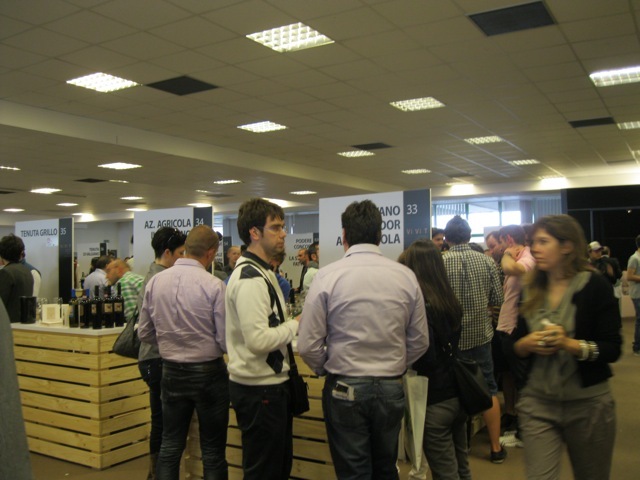 For those who generally go to Vini Veri and Vin Natur, two exhibitions that take place during the same period of the year as Vinitaly, perhaps this part of the show is not quite the novita’, for others though it allows them an opportunity to explore these wines. I had the pleasure of speaking at length with two producers, one from Lazio and the other from Trentino who were truly passionate about their work, their approach towards wine and their wine making philosophy. Sadly I also spoke with a producer who told me he had decided to follow biodynamic winemaking because it is a better “marketing” approach. Like in anything else, you find people who make decisions based solely on money, others who make them based on a more deeply held conviction about something in addition to a desire to make money. Don’t get me wrong, I have nothing against making money, love to make more of it, but I did find it the opposite of what I would have expected in this part of the fair. Perhaps that is just my naivete or as I prefer to think of it, the hopeful side of my indole (nature) coming out. 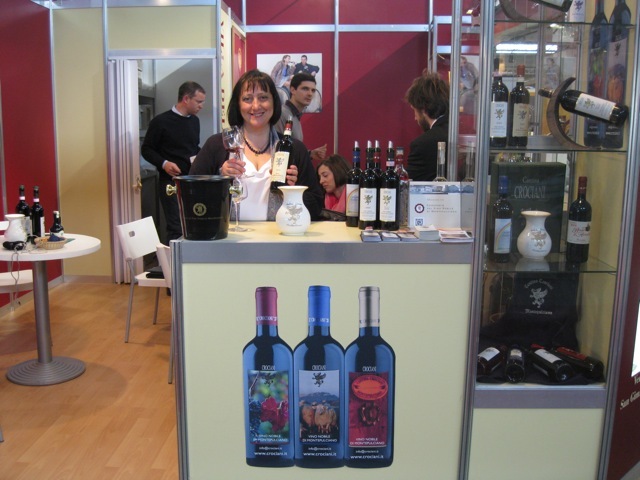 The first producer that I spent the most time with was Claudio Menicocci from Azienda Agricola Menicocci Cristina from Faleri near Viterbo (Lazio). His property also has ruins from 313 AD. He has been focused on “natural” winemaking for many years. He was the fifth producer in Lazio to follow biodynamics, he said. I tried two of his wines which were made without using sulfites, Stafilo and Rhesan. Stafilo is made with the Trebbiano grape while Rhesan is a blend of Sangiovese and Montepulciano. Claudio has more certifications than I have every seen, including the right to call his products vegan. One thing he said really resonated with me. “Wine is a food,” un alimento. What a simple yet profound statement. When one thinks of the food they eat, of course we don’t want there to be chemicals, pesticides and the like in it. We think about vegetables and fruits and animals and how they grow, are cultivated and mature. Why should we not think the same of wine? We all know it’s a living product that changes over time. “I don’t want my wines to be the same year after year that’s why I don’t put the year on the wine. I put the bottling date which is more a reflection of a particular time period,” he said. This too was simple yet profound as an idea. A bottling date is the same for all but if I buy a wine in May and someone else buys that same wine in December of that year, it will be a slightly different. The second producer I met was equally as fascinating but I’ll write about him another day. I hope to go each day during the fair to try a couple of these wines. Tomorrow, March 27, there are a number of interesting conferences on natural wines with the first French female Master of Wine, Isabel Legeron. Famed French producer Nicolas Joly will also give a talk on natural wines. Additionally, there will be a seminar on Demeter, a certified trademark for biodynamic wines. Lastly, Jonathan Nossiter, director of the film Mondovino will show parts of a new film he is working on during a talk with Giovanni Bietti, a sommelier and musician. I was very lucky to be able to taste these wines with my dear friends Teresa and Filippo, two knowledgeable sommeliers who always bring light to my life. Interesting article indeed. I am Fabrizio and I look after the UK market for Cristina Menicocci. 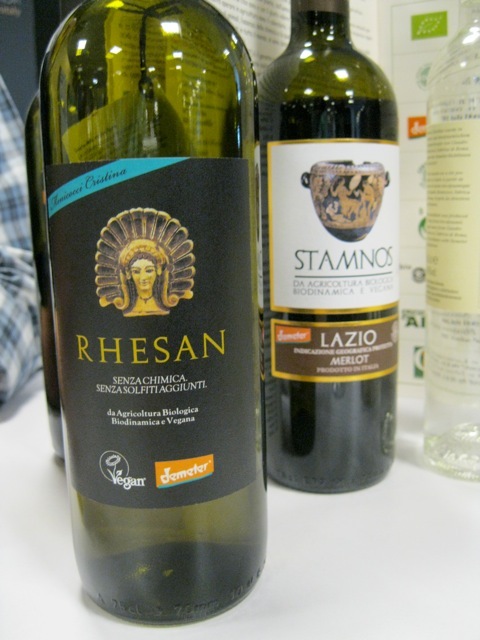 Above there is a small mistake (just grapes inverted): Rhesan is a Trebbiano, while Stafilo is a Sangiovese-Montepulciano. I will be exhibiting at VegFest Bristol next 25-27 May, stall no.20 in the Main Marquee. Thanks a lot for this article!! !